The culmination of my coursework in the Masters in Arts Administration and Policy Masters program at the School of the Art Institute of Chicago, my thesis was titled “Store-House For Emergent Knowledge: Proposal for a Vernacular Media Space in New Orleans, Louisiana.” Professor and Chair Rachel Weiss was my thesis advisor. Mark Allen, Founder and Director of Machine Project in Los Angeles, was my thesis reader. In cities across the world, we witness the emergence of new types of grassroots civic infrastructure initiated by artists, designers, architects, urban planners, scientists, farmers, technologists, and educators. Rooted in an ethos of mutuality and tangible connections between creativity, knowledge, and everyday living, these practices are potent forms of social brainstorming increasingly crucial to the way we engage with our immediate surroundings and envision the future. Too often, however, the creative practices that characterize these vernacular media fail to intersect, to locate common ground for fruitful collaboration, to meet their potential to propel society onward in some modest way. Yet it is through these incremental nudges that new ways of living are developed and tested. In response, my thesis utilized the business plan as both research methodology and outcome in order to imagine a new type of arts organization devoted to vernacular media. Recasting the business plan as a generative intellectual platform, I developed a proposal for an innovative space for exchange and collaboration called Store-House. Equal parts resource center, workshop, classroom, and performance venue, the New Orleans-based vernacular media incubator that I envisioned combines the stable physicality of a cultural space with the variable temporality and spontaneity of nomadic organizations. Informed by research into experimental public programming, grassroots approaches to development, and the local specificity of New Orleans, this thesis blurred the boundaries between artistic practice, scholarship, professional development, and civic engagement while providing a tangible blueprint for future endeavors. The accompanying image is a patchwork piece that I made as a compliment to my research. 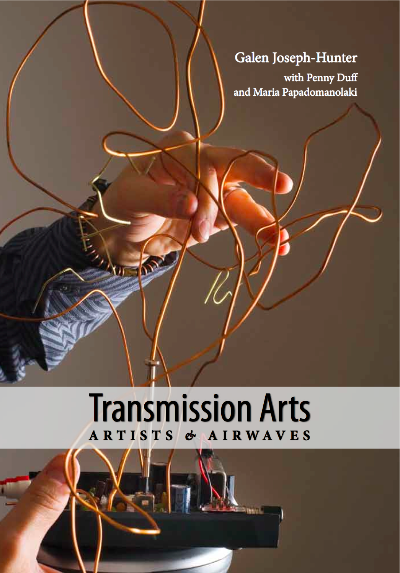 Transmission Arts: Artists and Airwaves brings together a genealogy of 150 artists and artworks — and more than 250 images — from 1921 to the present that encompasses performance, video, radio theater, sound art, media installation, networked art, and acoustic ecology. This is an account of the ingenuity and creativity of artists who have made new discoveries in broadcast, public works, performance composition, sound, and text, stretching the boundaries of both transmitter and receiver. At a time when public access struggles with corporate control of the airwaves, artists have combined activism and communications technologies to represent alternative worlds on the electromagnetic spectrum. PHONEBOOK 3 is a directory of independent art spaces, programming, and projects throughout the United States and a collection of critical essays and practical information written by the people who run them. PHONEBOOK 3 includes artist-run spaces, public programming, unconventional residencies, alternative schools, and community resources; all of the projects that form and support art ecologies across the nation, as well as historical documents marking their past. Featuring essays and documents from Group Material, Renny Pritikin, Susan Sakash, FEAST Brooklyn, Ox-bow, Faheem Majed, Chances Dances, Paul Durica, Dara Greenwald, Amy Franceschini, Pilot TV, Jon Brumit and Sarah Wagner, PLAND, Andy Sturdevant, Robby Herbst and more. The culmination of my coursework in the Masters of Media Arts program at The New School, my thesis was titled “Sonic Heterotopias: Reimagining the Social with Sound in Lucky Dragons’ Make a Baby.” Professor Barry Salmon was my primary thesis advisor. Professors Dr. Shannon Mattern and Dr. Jaeho Kang were my secondary thesis readers. This thesis postulated that an important undertaking for sound art works is the creation of spaces that, by temporarily disrupting the normative relationships which constitute everyday social experience, conceive of alternative modes of being-with-one- another. Michel Foucault’s concept of heterotopias—which may be understood as liminal spaces that, although embedded within the real spaces of everyday life, are not constrained by the standard functions of those spaces—was be employed in order to understand the motivations of sound artists whose deliberate sonic composition of physical space aims to reimagine the interrelational conditions of contemporary society. As the “simultaneously mythic and real contestation of the space in which we live,” the social relations that birth sonic heterotopias’ existence also inherently define them. In the facilitation of alternative acoustic situations, sound artists create spaces that emphasize the collective nature of personal experience in which the distinctions between subject and object blur, conditioning the possibility of alternative ways of being together and conceiving of communal life. Drawing upon theories of sensuous experience in aesthetic praxis, alternative relations to space, and awareness of the everyday acoustic environment, I developed a framework with which to explore the “sonic heterotopia” concept. Lucky Dragons’ participatory sound performance, Make A Baby, was used to situate the social and political potentialities that emerge from engaging with the shared spaces of human experience in an effort to reimagine the social in an era of increasingly mediated communication.